Photo! Editor (formerly known as Photo Toolkit) is a basic freeware image editor which integrates with Windows viewer. Once you've opened the program, the photo wizard will appear which allows you to remove red eye, enhance colors, sharpen the image and crop/resize photos.. among a few other options. For security reasons, you should also check out the Photo! Editor download at LO4D.com which includes virus and malware tests. Additional screenshots of this application download may be available, too. 4.5 out of 5 based on 46 ratings. Vicman Photo Editor has a presence on social networks. 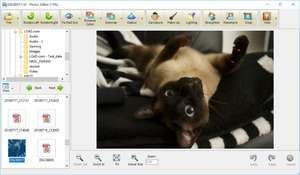 Vicman Photo Editor download been highly rated by our users.